Organza pouches - a cheap way to protect grapes! Vineyard owners and growers have a persistent problem with insects and birds when growing grape plants. In our offer you will find a fantastic and cheap remedy for this horror! With a little effort and very low costs, you can take care of your valuable crops! The solution is our thin and durable organza bags! This is a great way to protect fruits during their ripening. For all vine growers, any harvest losses are undesirable, so we recommend this very simple and effective way to protect your grapes against external factors such as: birds, insects and excessive moisture. Orgnaza is a very thin and transparent fabric that perfectly permeates the air. Thanks to this your fruits will be safe and well oxygenated. 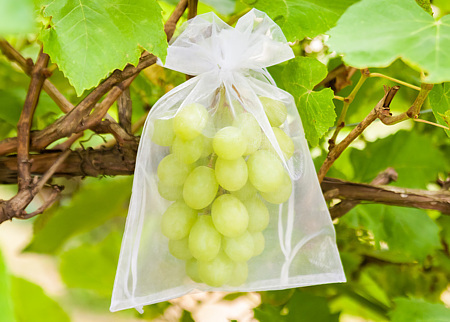 White organza bags for grapes do not absorb light so that they do not inhibit the fruit development. What is more, the density of the fabric itself will make the fruits inaccessible even to the smallest insects! ! Another advantage of protective grape bags made of lightweight organza is that they do not additionally burden the branches and are airy. Hence the fruits will grow healthily, not exposed to sun or rot! The bags are very easy to use! It takes just a few seconds to provide the grapes with additional and effective protection against birds and insects! That is why this method is gaining more and more popularity among farmers and growers around the world! Just put the organza bag on the fruit and pull the ribbon. Organza bags – effective protection against insects! We are aware that there are many varieties and species of grapes. That is why we propose a number of different sizes tailored to the needs of all customers!! The most popular are organza vinebags with size 22x30cm, 26x35cm and 30x40cm. However, we also have bigger and smaller sizes! Therefore, we can easily match anything for each grower of these wonderful fruits! See our full offer of organza bags! It is worth noting that our organza pouches are very versatile and can also be used as protection for other fruits. In this way you can protect gooseberries, peaches, pears and similar fruits. Organza bags to protect wine grapes - Try this method today! If you want to check the effectiveness of our innovative method to fight pests, please contact us. We have prepared free sample packages for all seriously interested. Thanks to this you can see for yourself that this way of protecting grapes really works! !